There was a time when America’s poor faced a stark choice between access to social welfare and full civil rights—a predicament that forced them to forfeit their citizenship in exchange for economic relief. Over time, however, our welfare system improved dramatically. But as Chad Alan Goldberg here demonstrates, its legacy of disenfranchisement persisted. Indeed, from Reconstruction onward, welfare policies have remained a flashpoint for recurring struggles over the boundaries of citizenship. 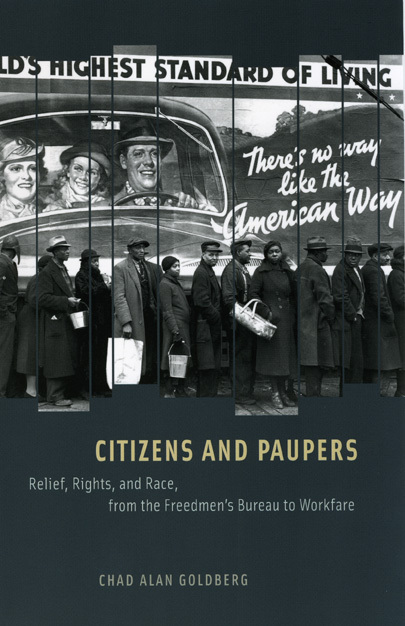 Citizens and Paupers explores this contentious history by analyzing and comparing three major programs: the Freedmen’s Bureau, the Works Progress Administration, and the present-day system of workfare that arose in the 1990s. Each of these overhauls of the welfare state created new groups of clients, new policies for aiding them, and new disputes over citizenship—conflicts that were entangled in racial politics and of urgent concern for social activists. This combustible mix of racial tension and social reform continues to influence how we think about welfare, and Citizens and Paupers is an invaluable analysis of the roots of the debate.